Fun, contemporary Japanese food and sushi. 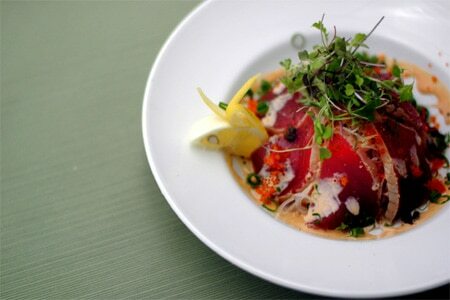 : Forget any preconceived notions about Sansei being just a traditional Japanese restaurant. In fact, owner D.K. Kodama's cutting-edge cuisine and upbeat ambience distinguish Sansei from other eateries offering the same type of food on Maui. Three sushi chefs roll their gourmet goods behind the bar. We like the seared foie gras nigiri sushi with caramelized Maui onions and unagi demi-glace; Japanese yellowtail sushi pairs with a spicy sambal. This is the perfect place to graze on a number of appetizers, such as lobster and blue crab ravioli or fried agedashi tofu. Entrées include roasted Japanese chicken with jerk spices plated with local vegetables, and beef filet crusted with shichimi served atop udon noodles. For dessert, consider pound cake-enrobed vanilla ice cream that’s coated in macadamia nuts and fried, accompanied by caramel and chocolate sauces. Wine, saké, martinis and beer are available.